Friday was orientation day for the Pre-K classes. I don't have any pictures for you, being director I am with the parents on the first day. We have a new Pre-K teacher this year. Mrs. D is great and has such wonderful new ideas for the school. She got to enjoy the day with our Pre-K classes. Our first day was centered around that adorable dog, Clifford. 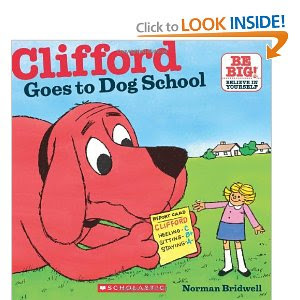 Mrs. D read the story, "Clifford Goes to School," by Norman Bridwell. She then had two Clifford activities for the class to do. One was to make a Clifford headband. She had drawn some ear shapes on red paper and had the children cut these out. Then she had a head band that they attached the ears too. The final piece was to write their names--in glitter of course. The other activity was a cutting activity. She had a picture of Clifford which they cut out, then glued to a large popsicle stick. So when everyone left that day it looked like a Clifford parade. Monday is the first day that the children will get dropped off and stay with us. It will be my first teaching day--exciting! I hope everyone has a great year with their children!